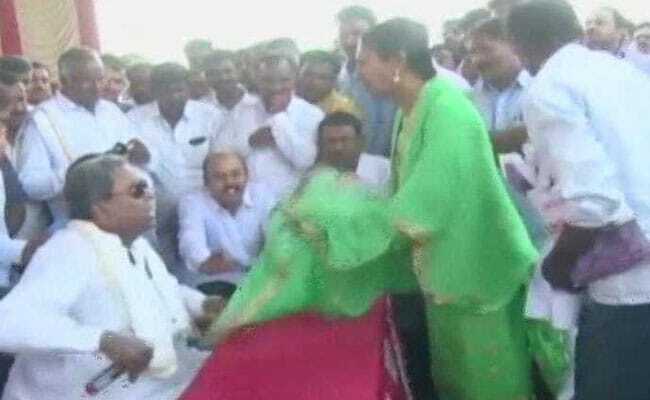 The Former Karnataka Chief Minister Siddaramaiah Misbehaves with Party Worker was caught on camera snatching away a mic from a woman’s hand, hitting her hand with it and pushing her down after she tried to raise her complaint at an event held in Mysuru. This incident took place in Gargeshwari village, Varuna taluk, Mysuru where Siddaramaiah had gone to attend the Karnataka Power Transmission Corporation programme. In the video, Jamalar, the woman, a former Congress Taluk Panchayat officer, is seen trying to put her point across. In an interview to News9, Jamalar said that she was agitated that Siddaramaiah had come to Mysuru and nobody had informed her. When she raised this question, Siddaramaiah is seen asking her whether it was his responsibility to inform her when he comes. Then, when Jamalar continues to voice her complaint, Siddaramaiah is seen rudely asking her to sit down. As he gestures angrily at her, at least two other men are trying to make her sit back down. Siddaramaiah’s son Yathindra is seen standing next to him, asking him to calm down. When she gets up and speaks, Siddaramaiah shouts at her and snatches away the mic that she was holding and in the process, also pulls down a part of her dupatta. He then takes the mic, tries to whack her on her hand and pushes her down to make her sit.